The first day of Barcelona was all about getting to know the city. The second day started with some of the city's famous beaches. The third day was all about a goal: get to the strange antennae-thing I saw in the hills and the nearby church-looking building nearby. Yes, I had forgotten to figure out what they were called before setting off. I figured it would add to the adventure anyway. I also had a back-up goal in mind: to ride 40 miles, which was going to be hard enough since I wanted to meet my wife at four in the afternoon and the busy streets, coupled with my tendency to stop every 1/4 of a second to take mostly blurry photographs, would make that goal rather ambitious as well. For a good stretch of Av. Diagonal - which is augmented with excellent bike lanes - I was behind the character in the photo who had a fixed gear….and only appeared interested in stopping at red lights so he could practice keeping his balance while the bike was motionless. We all had our challenges for the day. I then reasoned I needed to gain altitude since I thought I was near the antenna-thing, so I turned right and the smaller of the two chainrings was pressed into service. Little else happened for the next hour other than pedaling randomly uphill. From time to time I'd hit a dead end and I couldn't figure out if I was on a private driveway or a public street. Few cars and even fewer humans were on the roads. The nice houses I saw were quiet. Finally, after a particularly punishing climb, I reached a point where the pavement disappeared beneath me. The 100+ psi tires would be helpless on the terrain, so I dismounted, turned the bike 180 so I could lean it on a piece of fence, and looked at how far I had gone. I then looked at where I couldn't go and noticed some peculiar tracks in the ground. Studying them closely, I knew exactly what they were: Continental Mountain King II 29" x 2.2" mountain bike tires that were kept at about 30 psi. As if there was any doubt they were mountain bike tire tracks, two mountain bike riders came out of the trees, breezed by, and sped down the hill toward the city. I was definitely in a part of Barcelona I hadn't been to before, and the antenna-thing and interesting building never looked closer. Continuing my search, I headed partially back the way I came but tried to avoid going downhill as much as possible. I ended up on a part of the city that is very close to the highway, which meant some automotive traffic but also a service station where I found some nourishment: Sunny Delight (in a flavor not common in the States) and a large bag of almonds left a Shell station with me. The Sunny Delight was gone in seconds, and half of the almonds were gone in minutes. Moments later, on another dead-end climb, I ran into a cyclist from New Zealand who was nearly out of breath and in need of food himself from all the hills, and we chatted briefly. It was then that I realized something important: if you don't know where you are going, you can't ask for directions on how to get there. He couldn't tell me how to get to the antennae thing - but I told him where the Shell station was. We parted and I continued the hunt. Before long I found (what else?) another climb that looked incredibly promising. However, another series of twists and turns brought me to yet another place where the asphalt was replaced by dirt and I couldn't go further. Still, I was once again offered some great views as a consolation. I then saw more mountain bikers, and once again they were descending from the general direction of the structure I was trying to find. I then rode past Tanatori de Sant Gervasi, yet another building in Barcelona that looks cool but you're not sure what it is since you can't read Spanish. I pressed on, and just when I thought the city couldn't surprise me again I ran smack into the trolley. Just like that I was reminded of the great trip in Lisbon. I followed the trolley as it ascended…and ascended. The trolley tracks ended at a couple of small restaurants, but the road continued so I kept hammering the pedals. As far as I could tell, I was in Parc De La Font Del Racó - in a place far, far away from my hotel. The road twisted away from where I wanted to go, but it hardly mattered because, yet again, the pavement disappeared. I wasn't sure if I could have kept it up much longer anyway as I was around 900 feet above sea level at that point and my legs were getting shaky. I looked up and, using the zoom on the camera, took a picture of the mysterious building I now realized I wouldn't get to see on this trip. I found the statue of Jesus to be oddly comforting as his hand gestures seemed to say: "relax, cyclist: you're just on vacation." And there were a lot of cyclists around me - all mountain bikers - who clearly were getting that message. I turned around and left where I was (Parc de Collserola), strangely satisfied. I didn't reach the building, but maybe I could still make my 40 miles before meeting my wife at the hotel. I stopped at the little bar where the trolley had stopped and, after carefully locking the bike up, was dismayed to discover they didn't serve food. I ordered an ice tea and consumed the second half of the bag of almonds I had purchased that morning. So much for my plan to have a healthy lunch, I thought. I then raced down the hills toward the center of Barcelona. The miles evaporated fast and the altimeter on the Garmin reminded me just how much climbing I had done to get up there in the first place. Actually, I hadn't, but that's what this reminded me of: I was actually at Arc de Triomf, which did have its share of tourists milling about but it did have a nice vibe to it. As a bonus, there is a bike track nearly a third of a mile long encircling the park. To build up a couple of easy miles and creatively people-watch, I did a few laps before stopping at a bike shop nearby: Bicicletes (which didn't have 20" tubes). Remembering how nice it was the day before, I returned to the beach and the great path alongside. Much to my amusement, the rickshaw driver in front of me actually had a very similar bike box to the ones I have at home. I continued along and soon got to see the famous W hotel in all of it's shark-fin shaped glory. In case you are curious: it costs least 1/3 of a Brompton to stay there each night. I'm not saying they'll take one in trade for a three night stay, but, well, it is a ways out of my budget. Beyond it was the Ctra. Miramar hill - the switchback! - and I was determined to do it one last time. The day was perfect and just when I had only about six miles to go before hitting 40 miles...I got another flat. I ignored the sensation of my head shaking in disbelief as I found a bench in the shade and applied a patch. Unfortunately, for some reason - maybe the heat, maybe my poor motor skills - it didn't take. Not only that, but I…well…just look. Aluminum is not the best material for tire levers, I found. Lucky for me, I still had a couple of steel ones. I installed the tube I had patched the morning before. I installed it carefully…and it refused to take air from either pump. Hot, tired and closing in on 'annoyed', I drew from the Camelbak only to find I had no water left. It was now nearly three. Things looked grim. All I had left was the unproven Kenda tube that was a 1/4" wider than what was probably supposed to go in the tire. 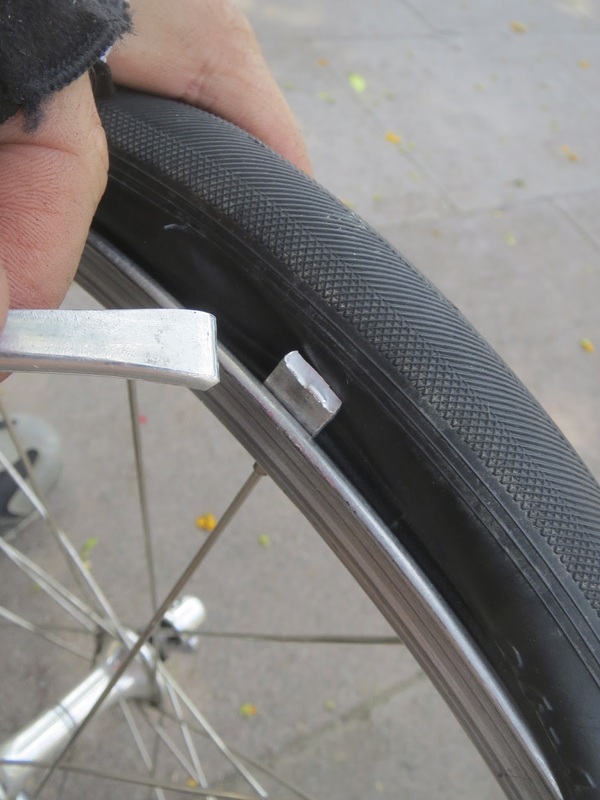 I installed it carefully…a pinch flat would doom me at this point. I gave it a few pumps and it took air. I leaned on the pump handle. It took more air. Finally I broke out the pressure gauge and found it was just about at 100 psi - and had gone on straight and true. I half-expected it to explode at any moment, but it didn't. It was also my last hope, and I realized it was my last chance to ride the switchback and hit my 40 mile goal. I put the wheel back on, adjusted the brake, threw the tools in the pack and set off. Nothing went wrong, and at this point I hoped nothing would: any flat now meant an undignified end to my Barcelona adventure and a walk back to the hotel. A year from now, when I'm getting ready for the next Urban Sketching Symposium/bikecation combo, this is the part I will be appalled at when I look back on this trip: rather than ride close to the hotel, I proceeded to put more miles between it and myself. With no water, I headed further from Meridian, past where I found the five Euro note, and began climbing the hill. I wanted - no, needed - to do the switchback one last time. I tried keeping the speedometer in the double-digits but it almost impossible. Up by the Hotel Miramar, I had a slight reprieve from the sun as I passed through the tunnel. Wishing for water, I climbed up to the 1992 Olympics diving pool and was reasonably sure that the next three miles would be a lot easier than the three I had just pedaled. Stowing my paranoia about a blowout, I turned the bike around and started down the hill. A pesky tour bus got in my way but I managed to get around it and pick up speed in the tunnel as I headed into the switchback. Now I should tell you that I like my Canon digital Elph okay, but it does has a fatal flaw in that you need at least one hand to operate it. Both of mine were occupied as I was gripping the handlebars quite ferociously, so I have no pictures of my last run. I do have to tell you it is quite an experience if you both focus on the road and on the scenery: the Mediterranean Sea is down the hill on your left, and then when you do the turn, suddenly the sea is on your right. It didn't feel like I was turning so much as it felt like the country of Spain was rotating 180 degrees beneath my tires. Go ahead on file that on your bucket list. I took the turn as fast as I dared and nearly nicked 40 miles an hour on what I knew would be my last descent in Barcelona. The final couple of miles disappeared. I looped through the traffic circle and headed up past the human statues, sketch artists and tourists crowding La Rambla. A final wave at Marilyn and a quick ding on the bike bell discouraged a tourist from jaywalking into my path. The speedometer pushed past 40 miles. I had done it: 100 miles in Barcelona. The bottle of complimentary room-temperature water was gone before the door to my room at the Meridien had finished closing. Silt and sunscreen spiraled down the bathtub drain minutes later. Shortly after I changed into non-bike clothes, my wife and I were reunited. After a great dinner at Luzia, right across from Meridien (the chicken was so good I took a picture of the food first) it was time to pack the bike up…and spend a final few minutes chatting with the passionate pen people of the Urban Sketching Symposium. Now trip wasn't like Santo Domingo, which was a fun trip but I don't feel like I need to do it again. With Barcelona (and, on a greater extent, Spain) I feel like I could easily return since I really saw very little, and once again I thank the Urban Sketchers for picking a winning location. And if you remember to hold fast to your valuables, have a good map and pack as many spare bike tubes as possible, the city will probably be as nice to you as it was to me. Thanks for reading and thanks for riding. Bike is very comfortable transport in big cities and when the weather is so good as in Barcelona, it's just amazing. The only time when we took taxi during our vacation was booked taxi to the airport via http://kiwitaxi.com/Spain/Barcelona+Airport.